Challenges: Can You Do This? 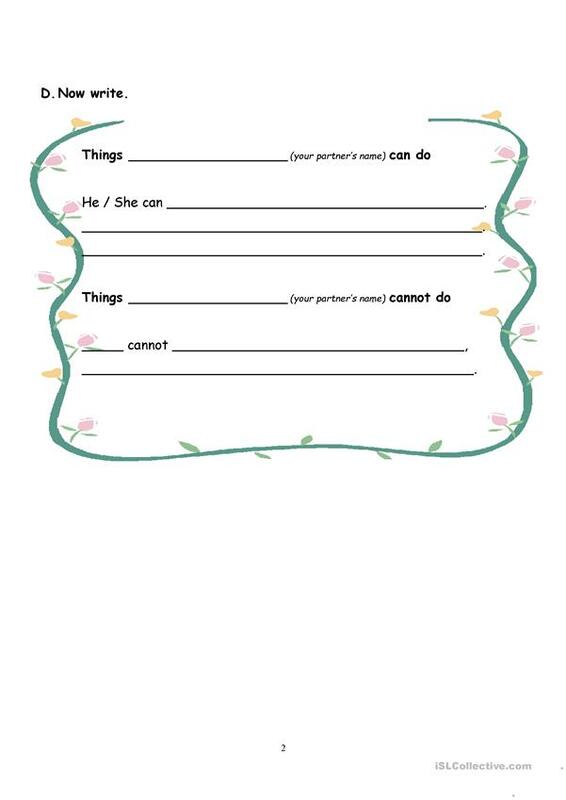 A pair activity for students to practice making questions and sentences with "can" & "cannot". Students challenge each other to do some simple tasks. The exercise ends with a sentence making activity. The present downloadable teaching material is best suited for elementary school students at Beginner (pre-A1) level. It is a useful material for teaching Modals in English, and can be used for improving your learners' Listening, Speaking, Reading and Writing skills. It focuses on the theme of Ability. adayylam is from/lives in Hong Kong and has been a member of iSLCollective since 2011-04-26 05:24:51. adayylam last logged in on 2019-04-09 08:29:48, and has shared 7 resources on iSLCollective so far.